Hendrick’s is Baaaack at the Edinburgh Fringe! Not long to go until the delightfully diverting Hendrick’s Emporium of Sensorial Submersion returns to the natural home of its unusual gin – the Edinburgh Festival Fringe (7th – 30th August). Within the sumptuous surroundings of 91 George Street, Hendrick’s Emporium of Sensorial Submersion will immerse festival goers in the experimental, the esoteric and the entertaining. Charming cocktails will enliven auricular and gustatory perception as you explore the Hendrick’s Gin soundscape. World-leading sound artist Mark IJzerman from the HKU University of the Arts Utrecht has unpacked each atom of Hendrick’s to create a programme of mind-expanding diversions to accompany the cocktail drinking experience. Be enlightened by the harmonious sounds of cocktail shakers in the ‘Cacophony Bar’, cleanse your mind as you enter the ‘Quietest Bar on Earth’ and be part of a mysterious and magical synaesthetic experiment in a delightfully peculiar laboratory. Those looking to simply brush the outer circles of their sensorial psyche can enjoy a delectable Hendrick’s Gin cocktail in The Hendrick’s Emporium of Sensorial Submersion bar. Peruse an array of curious oddities, including an extraordinary self-playing piano, the Pianola, Pavlov’s talking dog (trained to associate sound with taste through classic conditioning) and delight in the sounds of cucumber and rose – the twin essences of Hendrick’s Gin – at special listening posts. The sensorially adventurous may delve deeper and partake in the packed programme of synaesthetic diversions, offering stimulation and satiation for ears, mind and palate. Visitors looking for complete sensorial satisfaction can partake in all five experiences for ￡24, available through www.edfringe.com (ticket price includes a host of refreshing cocktails). The curiously minded can submerge themselves in any one of the sensorial experience for ￡8 (including one cocktail). Tickets for the latter are available from the venue box office. Author E.B. White once proclaimed the Martini ‘the elixir of quietude’. 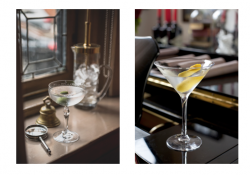 In the ‘The Quietest Bar On Earth’ cleanse your palate from sensory overload and enjoy a state of stillness as you marvel at the art of the wondrous Martini. Have you ever pondered what a cocktail would sound like if we could hear it? Using a most curious contraption we will uncover the secret quantumphysical voice of cocktails as we amplify the effect one has on the vibration of concoction’s sub-atoms, in the Soundscape of Hendrick’s Gin. Purify your mind and embrace your alpha brainwaves as our gongologist envelops you in sound taking you to a state of total mental relaxation. Our sensory stimuli are all interconnected. We have known this for some time, but we rarely prepare our beverages or cuisine with sound or colour in mind. In the lab, you become part of our experiments as we divulge the secrets of the way we perceive taste and sound. Bringing the story of gin throughout the ages to life in a sensory group experience. From the introduction of Jenever in the Dutch Wars to Hogarth’s 1751 engraving Gin Lane, take a trip through gin’s rich and intriguing history, exploring the sounds, smells and tastes that have made this esteemed spirit what it is today. Revel in the riotous dissonance of sound at the Hendrick’s Cacophony Bar and peruse our collection of oddities at your leisure, as you enjoy a delightful Hendrick’s Gin cocktail. Free admission midday – 11pm, with cocktails available from ￡6.